"The Note" is the eighteenth episode of Seinfeld. The episode was the 1st episode of the show's third season. It aired on September 18, 1991. Jerry, George, and Elaine get free physical therapy massage by getting a note from Jerry's dentist (Roy) to present to the insurance company. Jerry's therapist becomes paranoid and thinks Jerry is insane when he makes some casual remarks about a small boy who was kidnapped in Pennsylvania. 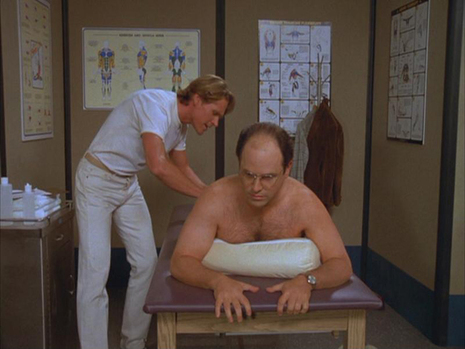 George becomes very uncomfortable when he finds out that his therapist is a man. He tells Jerry that he thinks 'it moved' during the massage and starts to have doubts about his sexual orientation. Meanwhile, Kramer claims he saw Joe DiMaggio in Dinky Donuts but the others do not believe him. According to Kramer, DiMaggio was a very 'focused' eater—the same way he used to play. Roy gets into trouble for passing around fake notes. In Roy's office, George becomes uncomfortable when Roy repeatedly asks for George's opinion of Evander Holyfield. George is quoted as saying "I mean he's a nice guy and a good fighter, but I don't LIKE him," thus building on George's insecurity about his own sexuality. Since he prefers a physical therapist over just a masseuse, Jerry tries to see the physical therapist masseuse once more, but can't because she's afraid he will try to kidnap her son. The episode ends with the four eating in Monk's, and viewing Joe DiMaggio dunking his donuts (though DiMaggio is never seen). George then says "You see, now that is a handsome man!" and Jerry and Elaine raise their eyebrows. Kramer tries to break DiMaggio's concentration by banging the table and yelping.